The countdown is on to Saturday, May 10th! Come see us at the East Farm Spring Festival! 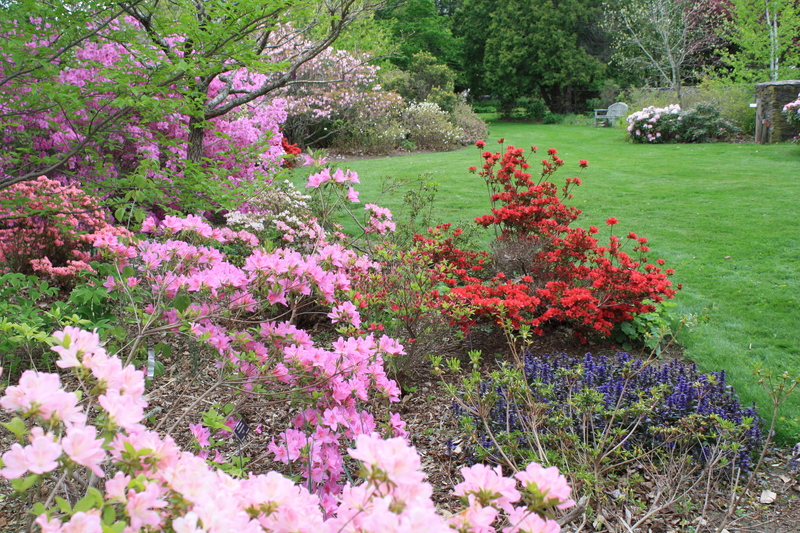 The URI Botanical Gardens will be selling Annuals, Garden-dug Perennials, and vegetable seedlings. 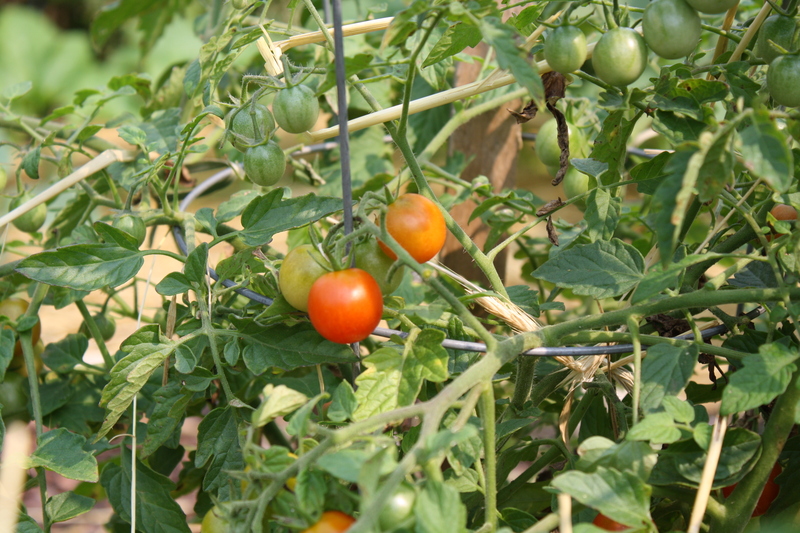 All-America selections, heirloom varieties, and more. All proceeds benefit the Botanical Gardens! Free parking, gardening demonstrations, vendors, food, children’s activities. This entry was posted in Botanical Gardens, Gardening, Greenhouse, Plants, Uncategorized and tagged all-america selections, East Farm Spring Festival, flowers, gardens, plant sale, Spring, tomatos, URI Botanical Gardens, vegetables on May 5, 2014 by uribg. 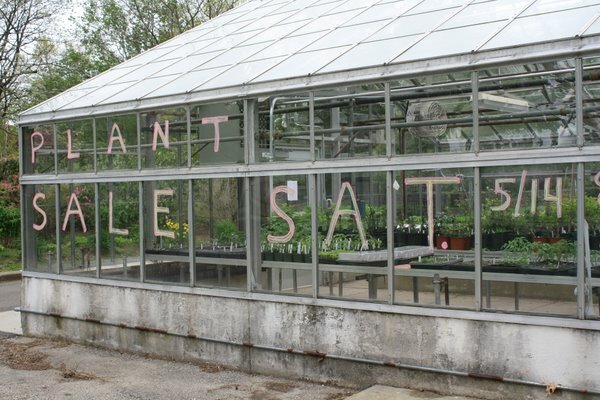 The official event announcement says the URI Botanical Gardens will be selling plants at the Greenhouse on Friday May 4th, Saturday May 5th and Friday May 11th. What it doesn’t say is how many beautiful plants of all kinds will be available! 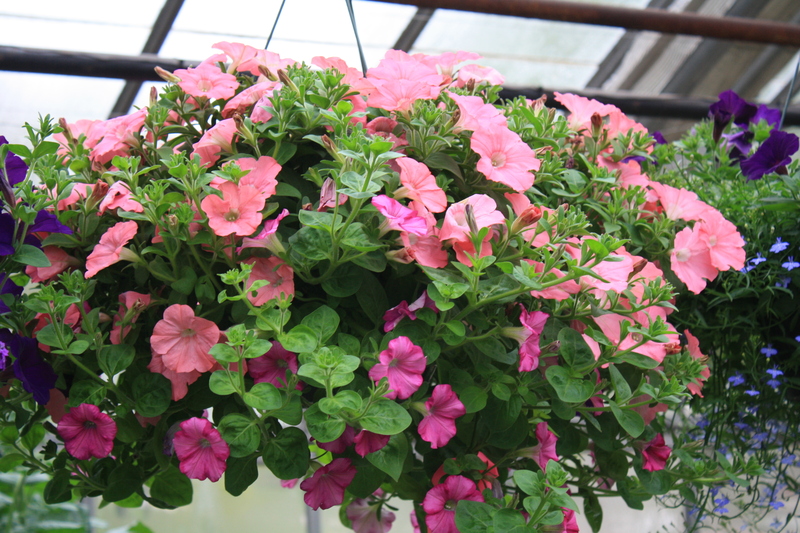 Incredible hanging baskets grown by the Greenhouse Management class, and donated to the sale. 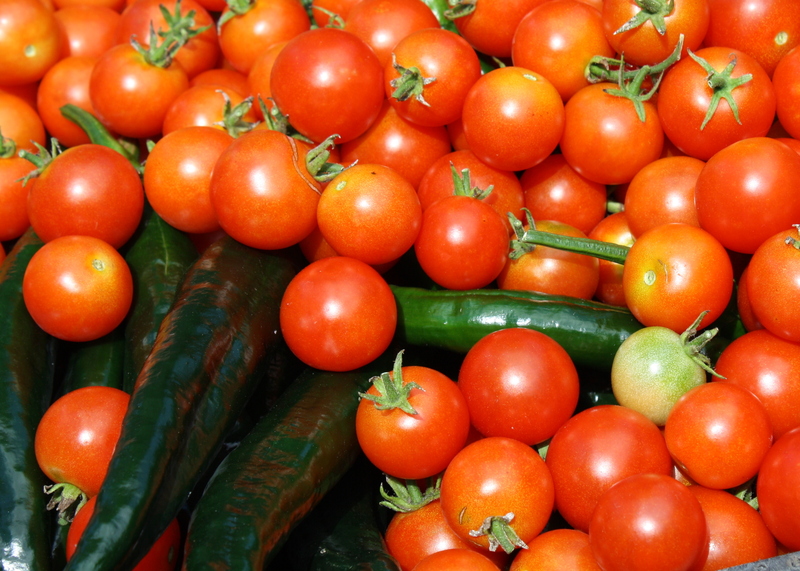 Ten, no TWELVE kinds of tomatos, not to mention basil, eggplants, leeks, parsley, cucumbers, melons and more. 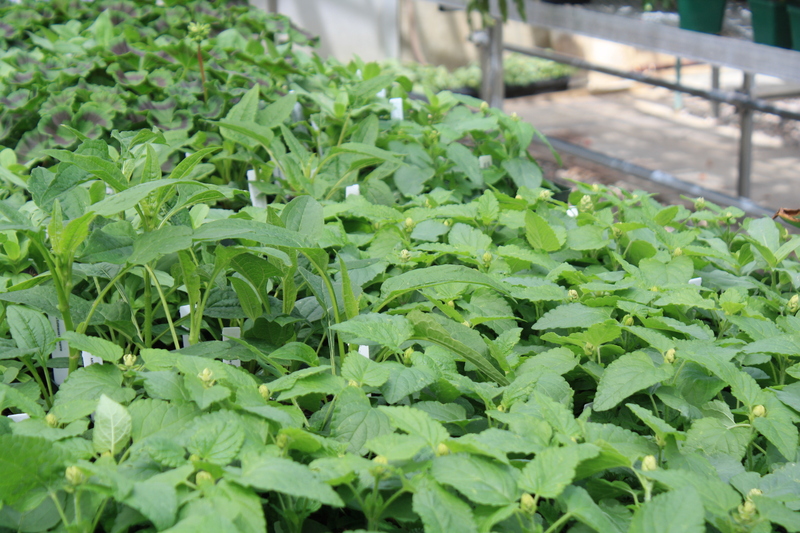 A limited number of seedlings from the All-America Selections, including great zinnias, a new apricot-colored Gaillardia and ornamental peppers. Perennials for shade, from the Botanical Gardens, including Solomon’s Seal, Epimedium, and the rare native Jeffersonia (Twinleaf). 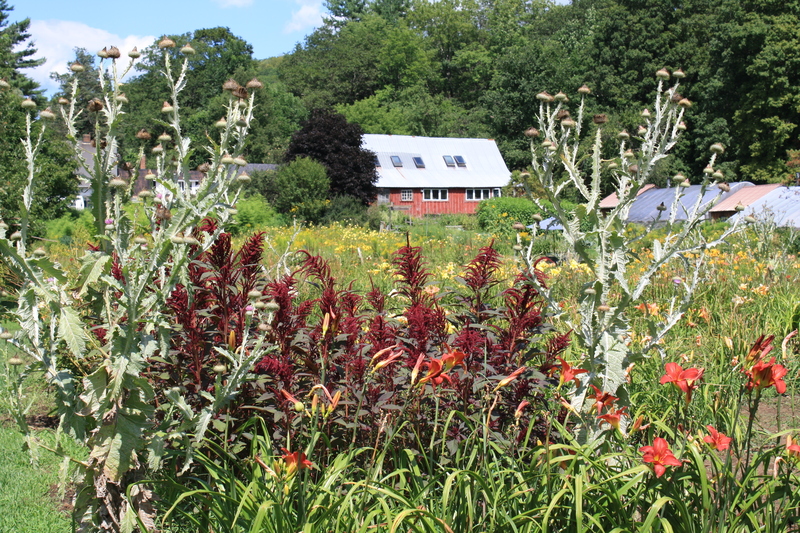 More perennials: Bee Balm, Eupatorium (Joe-Pye Weed), Wood’s Aster, Sedums, beautiful Agastache (Anise Hyssop)….I could go on and on but you will have to come see for yourself! On Saturday May 12th, we will move the sale to the URI East Farm Spring Festival. This is a big and exciting day with literally thousands of people coming to East Farm for plants, garden items like compost bins, workshops, raffles, food, and lots of fun. This entry was posted in Botanical Gardens, Conservatory, Greenhouse, Plants, Uncategorized and tagged beautiful flowers, greenhouse, plant sale, Spring, tomatos, vegetables on May 3, 2012 by uribg. Food from the Garden: If you know me, you know that’s near and dear to my heart! We picked another round of the peppers, eggplants, and tomatoes from the All- America Display Garden and brought it to the Food Pantry in Peace Dale. Earlier in the season everybody (that’s me and The Boys ) had a sampling of this bounty. The eggplants are amazing; there are so many, and each one is tender and delicious! Of course the cherry tomatoes are a hit, also prolific, and there are 4 kinds of peppers from mild and sweet to quite hot. The Food Pantry is happy to have fresh food, and it has been a highlight of the work week to deliver the harvest. 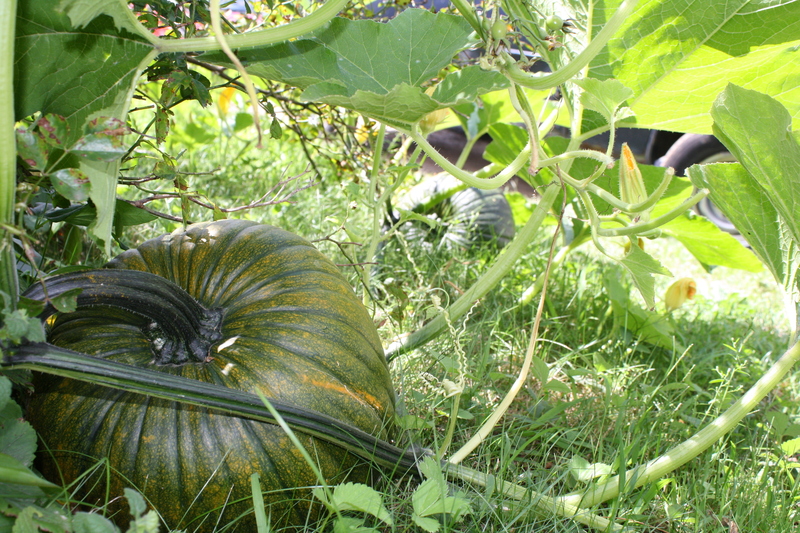 This year it looks like there will be at least 4 large pumpkins from the one monster vine growing near the CE Center: through the garden, over the fence, and across the grass. In contrast, the Christmas melon looks as lame as it did last year (what’s up?) but there are beautiful watermelons AND acorn squash getting bigger by the day in the upper Display Garden. 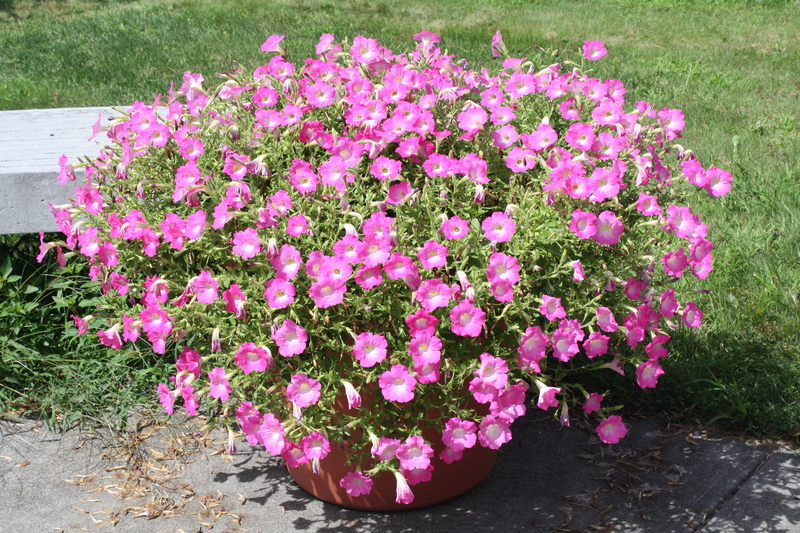 Dodge the trucks and crates of glass to see them in between the greenhouses, and enjoy the pink petunias (‘Opera Supreme Pink Morn’) keeping it cheerful over there. Other Garden goings-on: I finally saw honeybees in the garden (where have they been all summer?? ), along with a praying mantis. Mike said he’d eat a worm — does that count as Food from the Garden? A Tuesday Tour tonight at 5 PM, should be a lovely cool evening. Finally, here’s a picture from Olallie Daylily Gardens, in South Newfane, Vermont. This entry was posted in Botanical Gardens, Gardening, Photography, Plants, Public Gardens, Uncategorized, Vegetable Gardens and tagged all-america selections, beautiful flowers, fresh food, gardens, photography, summer, tomatos, vegetables on August 23, 2011 by uribg. July is hot, no doubt. Even the photos seem to radiate the heat of the day. It’s been dry, and the weeds slow down, but everything is a little droopy under the fierce sun and high humidity. 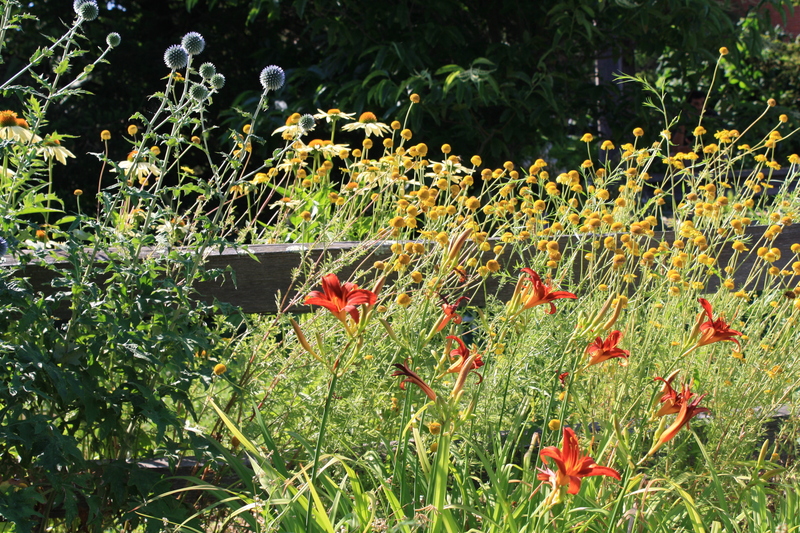 I love the garden in full summer: Day Lilies, Echinacea, Bee Balm, and Black-Eyed Susies all clamoring for attention. There are cherry tomatoes from our All-America Display Garden to throw in my salad at lunch time, and the pumpkin vines seem to double in size every night. The garden is bright and hot. 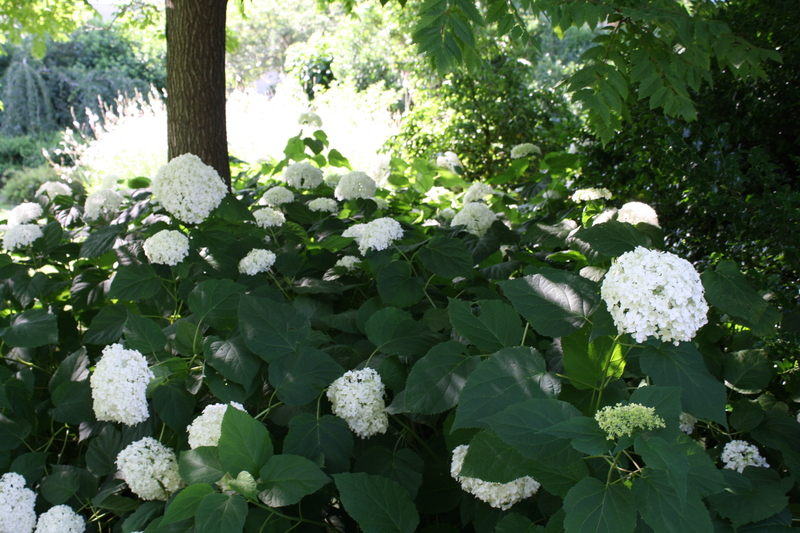 In contrast, the ‘Annabelle’ Hydrangeas, in full bloom under the Kolreuteria, look cool and delightful. As the shadows lengthen, it’s an inviting spot for a picnic, or a nap. 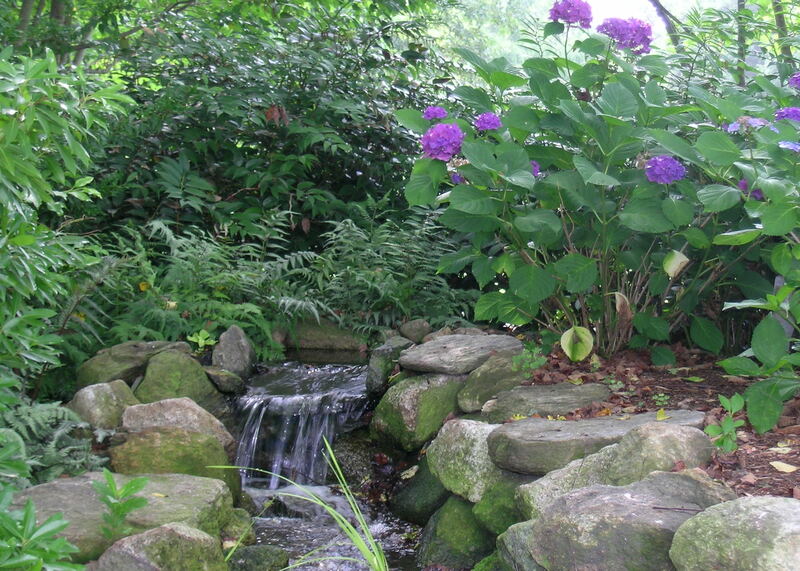 The water garden calls out at this time of year, the trickling sound of the waterfall somehow bringing the temperature down. I’ll work in the sun for a while, then in the shade, that way the day passes quickly. And if I can get to Matunuck for a swim after work, July is pretty much my idea of heaven! This entry was posted in Botanical Gardens, Garden photography, Gardening, Plants, Public Gardens, Uncategorized, Vegetable Gardens and tagged all-america selections, beautiful flowers, flowers, gardens, hot, July, photography, plants, summer, tomatos on July 20, 2011 by uribg. 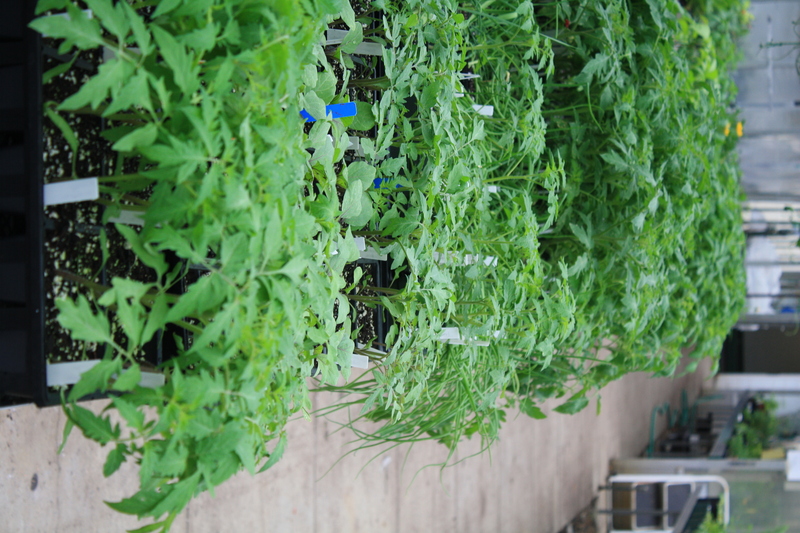 First, anticipation: I dream big about the possibilities of the growing season. I might find that perfect plant for my home garden (but where would I put it? I couldn’t wedge another plant in with a shoe horn!) I could buy that perfect plant for someone else who would love it. It’s great to see all the enthusiasm for gardening… everyone is a potential gardener in May! Next, dread: The amount of work and the logistics of holding a plant sale. Will people show up? Will we raise money for the Botanical Gardens? Will we have the plants people want? Do we have enough change, enough signs, enough advertising, enough help? 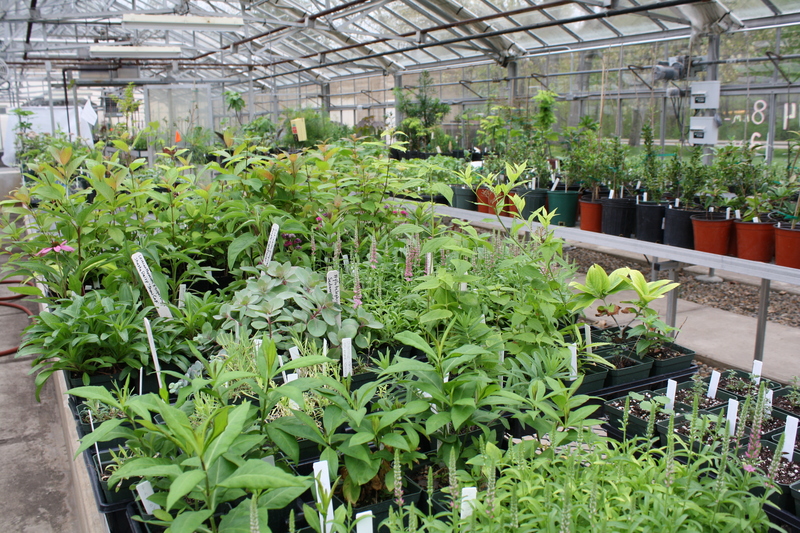 Regardless of all the above, the Botanical Gardens will be holding it’s 2nd Annual Plant Sale this Saturday May 14th. 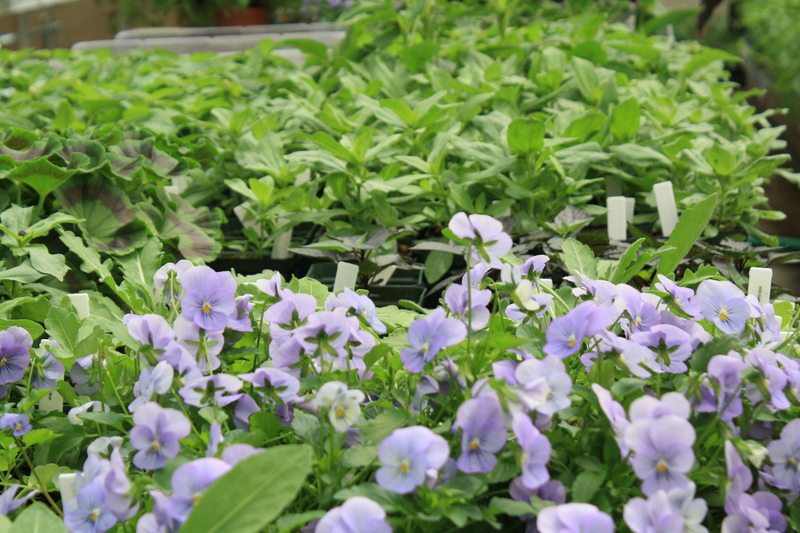 The Greenhouse will be open from 8 AM to 2 PM and we will be here offering annuals, perennials, vegetables and more. 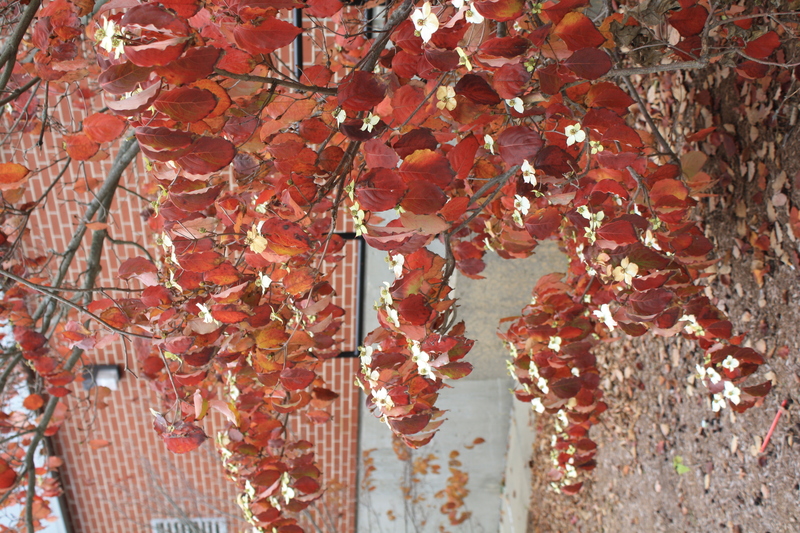 Trees and shrubs from the Gardens and the Horticulture Program at URI will also be available. Screened compost can be purchased at this time as well. 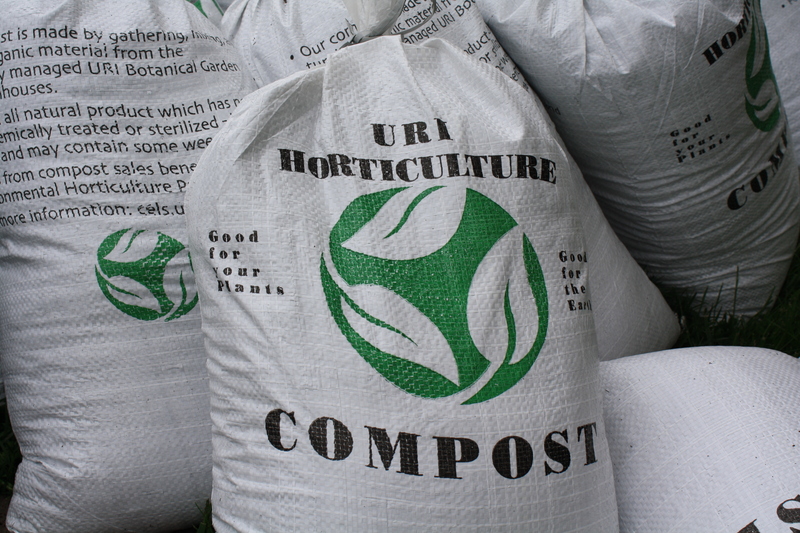 The greenhouse elves are busy bagging the compost right now! All proceeds from our sales go to the upkeep of the Botanical Gardens and Horridge Conservatory, free and open to the public year-round. That way, you can get a plant you love and donate to a good cause at the same time. While you’re here, take a walk around the gardens and maybe see how that special tree you just bought actually looks in the landscape. 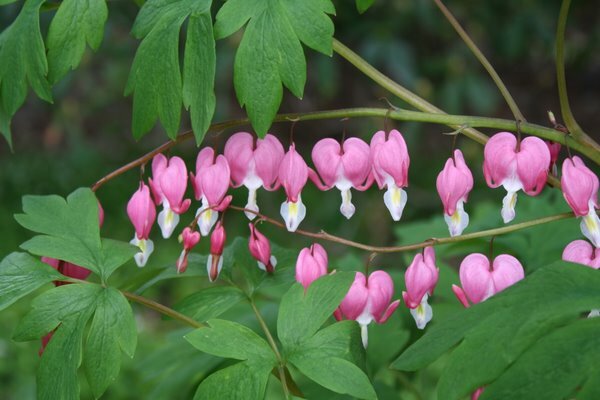 The Azaleas are blooming, the Dicentra in the shade garden is at it’s peak, and the sweet fragrance of Viburnum carlesii / Koreanspice Viburnum is around every corner. 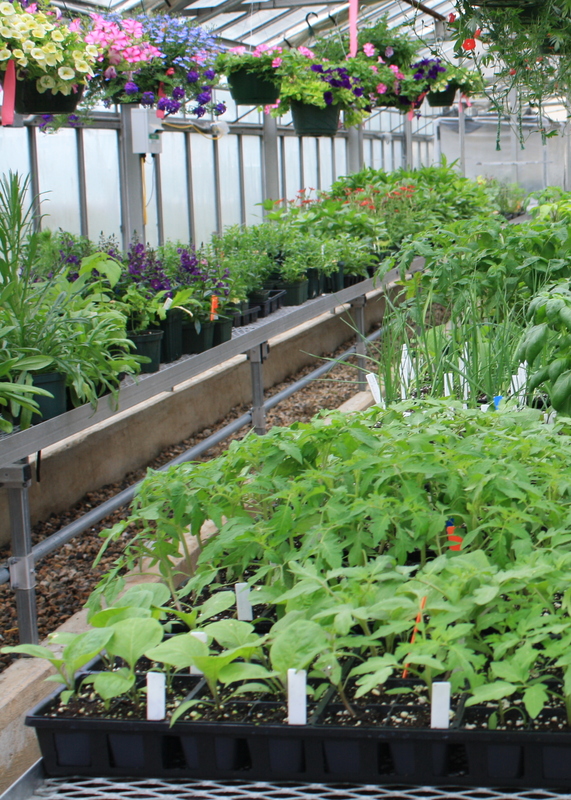 Find directions to the Greenhouse on the calendar page of our website, cels.uri.edu/uribg. (Click on the May 14th plant sale.) See you Saturday! This entry was posted in Botanical Gardens, Garden photography, Gardening, Greenhouse, Photography, Plants, Uncategorized and tagged annuals, anticipation, beautiful flowers, flowers, greenhouse, horticulture, perennials, plant sales, Spring, tomatos on May 12, 2011 by uribg. We’ve had frost and even snow, but other than that, the weather’s been mild. I’m still eating tomatos from the garden, which I picked green and spread out on a table in the cellar. They slowly turn red (or orange — SunGold and Orange Banana) and taste pretty good, for November. 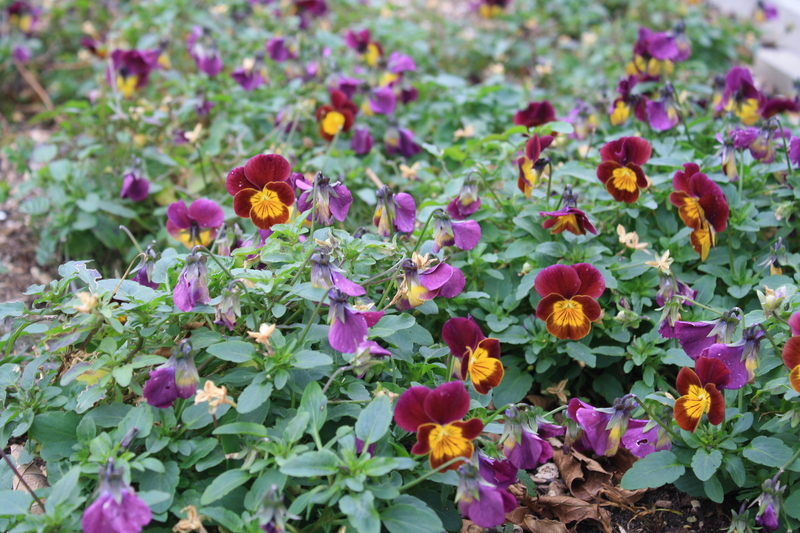 Out in the Botanical Garden, fall color was subdued, but some perennials are still flowering. Some are “confused” and are just beginning to flower, instead of waiting for spring. Since the trees were less vibrant than last year, seeming to go from green to brown and gone in about a week, it’s been a treat to have these bright spots of color scattered through the garden. I’m not too surprised to see Violas and Calendulas, and even roses flowering now (the roses were flowering at Thanksgiving last year). 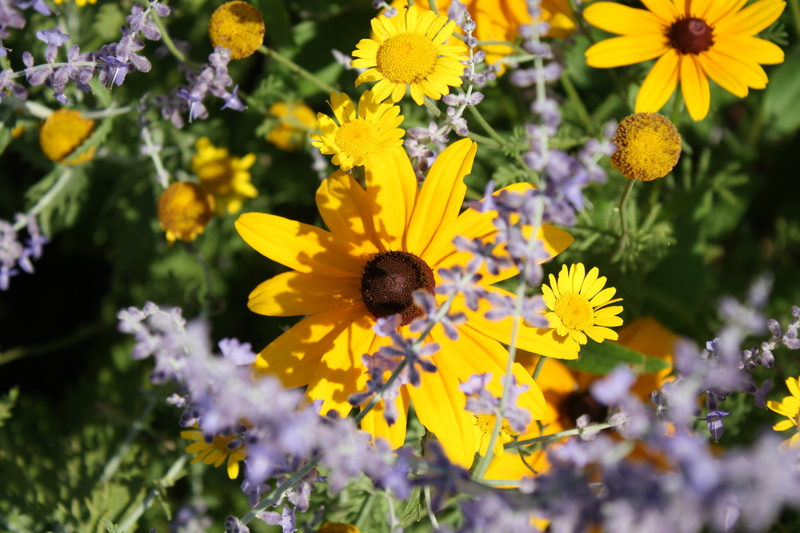 But the Echinacea and the Gaillardia are unexpected, since they love heat and usually give up once it gets cold. 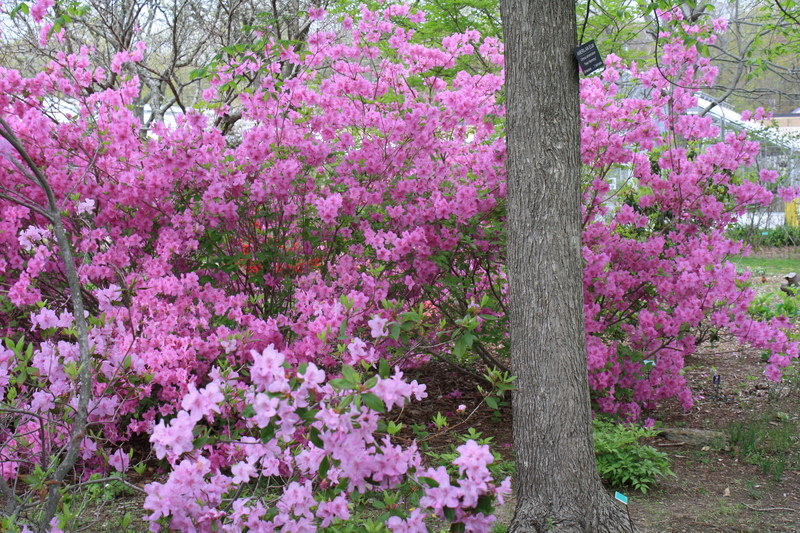 The real surprises are the flowering shrubs….I ‘ve seen Rhodies flower occasionally in autumn, but not Kousa Dogwood. 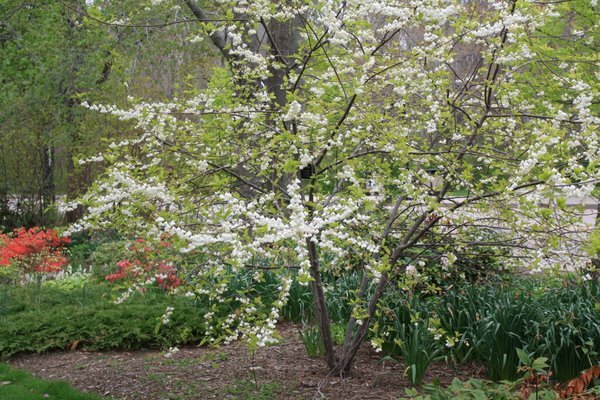 (I have a feeling that particular dogwood is on it’s way out). Eventually, it really does get cold and wintry, even here, so enjoy the flowers while they last. This entry was posted in Botanical Gardens, Garden photography, Gardening, Uncategorized and tagged fall color, flowers, tomatos on November 17, 2010 by uribg.